Genomic lesions have to be shielded from unwanted enzymatic activities, so that repair proteins have time to arrive at the damaged site and take care of the damaged region. One way how this can be achieved is by compartmentalization, i.e. 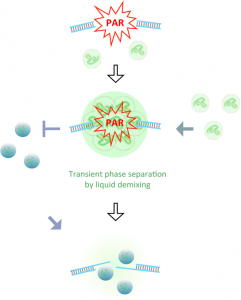 by subdividing the soluble nuclear space and generating a repair compartment around the DNA lesion. Such membrane-less compartmentalization can occur by liquid demixing of soluble components, culminating in a liquid-liquid phase separation. We recently discovered that poly(ADP-ribose), a nucleic acid-like molecule generated at genomic lesions, assembles multiple proteins with low complexity domains and that this triggers their dynamic phase separation. Current work in the lab aims at characterizing the physicochemical principles of PAR-seeded phase separations and at elucidating their functions for genome integrity maintenance. Altmeyer M, Neelsen, KJ, Teloni F et al. Altmeyer M, Toledo L, Gudjonsson T et al.